Uniquely created jewellery and other lovely things! Come and browse over 300 designs. I was born and have lived all my life in the beautiful Forest of Dean. All of my travels have brought me back home to this magical place, where I live with my husband and four amazing children amongst the deer and the bluebells - who wouldn't be inspired! 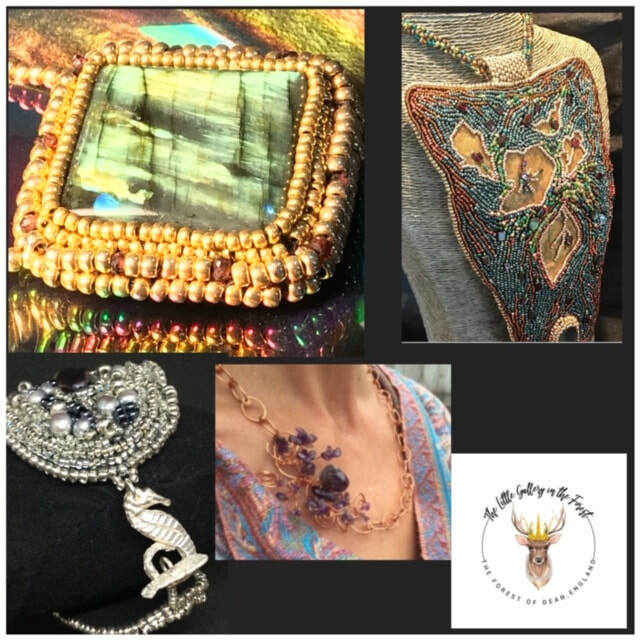 My work includes textiles, embroidery, felting, wirework, beading and clay, all topped off with gemstones and pearls. The jewellery is designed and created by myself in my own workshop so that you can get the 'exquisite look ' with genuine gemstones and freshwater pearls but without the extravagant price tag: a simple pair of earrings to match a gorgeous necklace, or a totally 'off the wall' extravagant design to take you straight to 'the Red carpet'. Unique wedding jewellery for that extra special day. The choice is yours -commission that special piece just for you or just pop in for a last minute gift for a friend . Studio visitors (individuals and groups) welcome by appointment OUTSIDE of Open Studio Dates.